Jimmy... Superman is another one you can just change the link on the old review for me. This Superman movie holds a record for me. I saw it in one theater or another...11 times! That's right. Luckily, I was in my movie-going "prime" then...I was also still a big comic book geek and Superman was my favorite super-hero and this remains my all-time favorite super-hero movie of all time. I love the Christopher Reeve portrayal of Superman (he looks just like the comic book character) and the effects (even though they do look a bit dated now) and the movie score is one of my favorite soundtracks. I think you should have altered the "cast" you list there, though, Pete. The top 3 names are listed in proper credits order (since Brando and Hackman are the big names) and then Christopher Reeve as the title character...but then everyone else is listed in alphabetical order (they did this to get even with Margot Kidder I remember who was making a stink about where her name in the credits would be). But Margot definitely should be right after Reeve's name...not Beatty! It just dawned on me that since Tobey Maguire isn't going to make anymore Spider-Man movies that Chris will remain (for now) the only one to be the title super-hero in 4 movies. I guess you can also include Hugh Jackman in there, too...but technically his first 3 appearances as Wolverine were X-Men movies and not just Wolverine pictures. I never saw Superman at the cinema (not as old as Roger! ), but I've always had the feeling it should be a front-runner for one of the finest cinema films ever made. Surely nothing like it had been seen before; a large scale fantasy that people could identify with. Who hasn't dreamt of flying? And here was Christopher Reeve doing just that, over a recognisable world. Of course, Superman had been seen on TV before, but not in dazzling colour, or with that brilliant theme. To be honest I didn't even notice how the cast was listed. All the technical info is pulled directly from DVD Profiler (DVD collection program most of us use)... which goes in the exact order they are in the credits. A cross country race is being held and the winner gets to eat and dance at a fancy restaurant with Rota as their date. 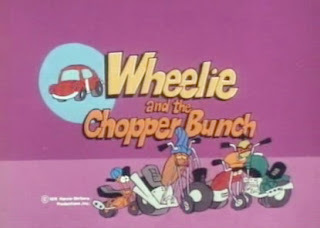 Will Wheelie win the race or will Chopper and his bunch spoil it for him and win it themselves? This was never a favorite cartoon of mine growing up. But I promised Brittany I wouldn't watch any of the ones she is interested in seeing without her.... and well... she isn't out of bed yet. And of course when she looked at the list... she was interested in all the good ones... only leaving me a few to choose from she wasn't interested in. While not terribly hard to watch... it remains far from my favorite of '70s cartoons. I mean this is a far cry from the wonderful work that Disney/Pixar did with their movie Cars. Unfortunately... they seen fit to put 3 of these on the '70s set that I have. More then any other show on the set. My first car was a 1972 yellow VW Beetle! I loved that little car. One of my brothers is in some sort of VW club... he has a nice one... though I haven't seen him drive it around here in a while. And we don't keep in touch as much as we should. From famed horror master Wes Craven comes a chilling thriller starring acclaimed actress Linda Blair! When Rachel's cousin Julia comes to live with the family at the farm, unsettling things begin to occur. Casting an alluring spell over everyone she meets, Julia slowly lures everyone away from Rachel. Terrifying instances of the occult begin to take place, forcing Rachel to fight for survival against what is revealed to be a horrifying demonic presence! After watching The Exorcist with Brittany the other day... I felt like watching another movie with Linda Blair. This is actually an old TV Movie. Yes I realize there is an MPAA rating above for this movie... but it is one of those rare occasions where a TV Movie put through the MPAA for an official rating at the time of it's DVD release. Another familiar face in this movie is Fran Drescher (The Nanny) who has a small part as Rachel's friend. This is actually one of the few movies I have dealing with witchcraft... at least compared to other horror sub-genres. Being a '70s TV movie there is of course no type of gore and most of the bad things that happens occur off screen. But it is a good story with characters you care about. I enjoyed this one quite a bit... I would recommend checking it out. In The New Adventures of Batman, the "Dynamic Duo" fights crime in Gotham City, encountering the classic Batman rogues gallery as well as some original villains. Complicating matters is Bat-Mite, a well meaning imp from another dimension called Ergo, who considers himself Batman's biggest fan. As a result, he wears a variant of Batman’s costume and attempts to help him, only to often create more problems (although he is occasionally an asset). The Joker steals an experimental hydrogen-powered car, disguising himself as the inventor, but without his knowledge of the car's weakness. I always liked the Batman cartoons... and this one is no different. But it is my least favorite incarnation. That is all due to that aggravating addition to the series... Bat-Mite. Not only is he aggravating and annoying... but I see no need for a supernatural being from another dimension in a Batman cartoon. Get ready for nonstop surprises in this classic Disney fantasy adventure as you escape to the amazing world of Tony and Tia Malone. Join brother and sister on their exciting quest to unravel the mystery of where to call home. At first their extraordinary powers prove irresistible to millionaire Aristotle Bolt (Ray Milland), who wants the kids to make him richer. Trying to escape, they meet an impatient camper (Eddie Albert), but win him over with their uncanny abilities. Now the ultimate chase is on, heading right into an out-of-this-world and unexpected finale you won't want to miss! This is a DVD I bought Brittany for Christmas back in 2006. But for some reason never watched it till now. So I haven't seen either movie in this set since I was a kid. It is a fun... entertaining family movie. Sure it shows it's age... especially in some of the special effects such as the flying camper. But that is easily forgiven with the over-all fun of the movie. Watching this movie with Brittany today really brought back some memories for me. Fun time. Animated childrens show about a dog who is the janitor for a police station...until danger threatens, at which point he turns into the martial arts superhero Hong Kong Phooey! The Hopeless Diamond has recently been stolen, so Hong Kong Phooey looks into the issue in hopes of finding it; though things soon take a turn into the unexpected when it seems a recent string of Kangaroo thefts may be related to the theft of the Hopeless Diamond. Another fun episode. This was the last of the Hong Kong Fooey episodes in this set. One of these days I really should get the entire series. I know it was released long ago! I am sure Brittany would love to see them all as well. With Salem’s Lot, a blood-curdling shocker based on the novel by Stephen King, director Tobe Hooper (Poltergeist) sends the time-honored vampire legend soaring on bat wings into the modern era. Sinister events bring together a writer (David Soul) fascinated with an old hilltop house, a suave antiques dealer (James Mason) whose expertise goes beyond bric-a-brac and the dealer’s mysterious, pale-skinned "partner" (Reggie Nalder). The solid supporting cast of vampire victims and fighters includes Bonnie Bedelia, Lew Ayres, Elisha Cook, Ed Flanders, George Dzundza, Lance Kerwin, Geoffrey Lewis and Marie Windsor. It’s hard to keep the undead down. And so easy to be scared in Salem’s Lot. I have loved this one since the first time I saw it back in my teen years. Of course this is an adaptation from the book that Stephen King wrote. Who of course is my favorite horror writer. For a movie that is just over 30 years old... this movie has some decent scares in it. I personally haven't been scared from it since I was a kid... but I do remember it would scare my wife every time we watched it. A couple of my favorite spooky parts in this movie is ..
1. The kid vampire scratching at his friends window.... pleading with him to let him in. Needless to say... this is one I would always highly recommend to any horror fan... and an absolute must see for any fan of vampire movies. Now... please lets see a dvd release of Return to Salem's Lot! It has been so long since I seen the sequel I can't remember anything other then it's existence. I see I have 3 reviews for this one already Jimmy... you can replace all 3 with this one. Though I would keep the year up there to show which version it is.